M6G Manage Abundance Because God is El Shaddai | GOD Who Are You? AND Who Am I? HOW DO WE MANAGE ABUNDANCE WHEN IT COMES? We are warned, “You may say to yourself, ‘My power and the strength of my hands have produced this wealth for me’” (Deut. 8:17), but remember it is the Lord alone who is our only source of supply to whom we give and from whom we receive, in order to establish His name on the earth. In reality, when we have abundance, we may feel the tithe remains enough to give, if we even do that. Should we tithe from the gross or the net? Most pastors would say either, but first fruits come off the top, the gross. However, giving from the net is a good place for beginners to start, and then increase from there. God made a promise to the Israelites, “Little by little I will drive them [enemies] out before you, until you have increased enough to take possession of the land” (Exod. 23:30). Little by little, no matter how large or how small our income, this is our promise—to see debts, etc., driven out, leaving more money to give to the Lord’s work in the land. One pastor challenged his people to give a double tithe. Why not make twenty percent a long-range goal? Track what God does. This can easily be done by taking each year’s income tax return, finding the amount of giving on Schedule A—Itemized Deductions—and dividing it by total gross wages. One benefit of tithing on gross wages means never having to worry about paying income taxes. Not only does the higher deduction help, but God’s return on money is a supernatural thing that cannot be explained. Even if we do not itemize deductions, we can take joy in tracking the increase of giving and receiving. Why not set a reasonable budget to live on and give the rest away? Jesus says, “Watch out! Be on your guard against all kinds of greed; a man’s life does not consist in the abundance of his possessions” (Luke 12:15). Without a plan, we will be tempted to spend any extra on extravagant living. And without a responsible plan it may not happen at all. Remember the verse in James 4:2, “You do not have, because you do not ask God.” The very next verse says, “When you ask, you do not receive, because you ask with wrong motives, that you may spend what you get on your pleasures.” God gives us richly all things to enjoy, but it is our motives we must always keep in check, because wealth is so uncertain (see 1Tim. 6:17). We must take the limitations off what God desires so badly to do through our lives. Stanley Tam’s story shows what He can do. Stanley started out just like most of us—broke. At a young age, he chose to honor God with his small income. Daily obedience to God’s leading brought increase and abundance to the point that he legally made God the senior partner in his business—hiring a lawyer to do so. From there, he went from giving 51 percent to giving 90 percent and living on the ten. He founded three businesses: United States Plastics, States Smelting, and Industrial Safety and Tamco. At eighty years of age, he travels twenty-five weeks per year speaking at churches. His inspiring story is in God Owns My Business. Every Christian can follow his example—whether a business owner or not. WHAT IF WE DON’T BLESS OTHERS FROM OUR ABUNDANCE? From the same passage of Scripture in Luke where Jesus discusses possessions, he tells a story about the rich fool. The ground produced him a very rich crop. He decided to tear down his small barn and to build bigger ones to store his abundance, and he said to himself, “You have plenty of good things laid up for many years. Take life easy, eat, drink and be merry” (Luke 12:19). “‘This is how it will be with anyone who stores up things for himself and is not rich toward God’” (Luke 12:20-21). “Return to me, and I will return to you,” says the Lord Almighty. “But you ask, ‘How are we to return?’ “Will a man rob God? Yet you rob me. “‘In tithes and offerings. You are under a curse—the whole nation of you—because you are robbing me’” (Mal. 3:7-9). 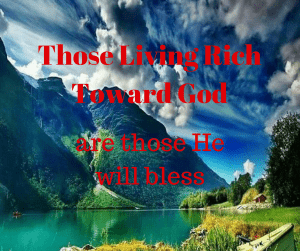 Not living rich toward God means not tithing. The stranger had prospered in the worldly sense of the word at some time in his life, but he was not a blessed man. Fear, not faith, ruled his life. He hoarded his money and could not even part with a small portion to repay his gracious hosts for the food he ate from their table. It was obvious to him they could use it. And the car he feared to buy is what eventually took his life. The money from the stranger would have been a trap for Grandma and Grandpa if they had accepted it. It was not blessed money from anyone wanting to bless them with it. The man was thinking only of himself. Leaving without reimbursing for gasoline and food proved that. Deuteronomy, Chapter 7, warns the people not to covet silver or gold from the ungodly because they could be snared by it, “for it is an abomination to the Lord your God” (Deut. 7:25). Abomination in Hebrew means “morally disgusting; things which belong to the worship of idols.” The man loved and worshiped his money believing falsely it could buy anything. Grandma and Grandpa chose against the snare of money and passed the test. Better still, they gave of themselves to those who were unable to return the favor. During the Depression years and every difficult year, Joyce’s grandmother had enough food for everyone who came to her door. This seemed unbelievable since her cabinets barely had anything in them. Like the manna, those who gathered little had enough—it stretched and multiplied. Grandma cherished the jelly she made and rationed it to her family. After it was destroyed in one of the fires, she resolved to never again withhold any food. She learned: when we come to an end of our own means, we will see the provision of the Almighty. It is not by chance that manna and wealth are used in two sentences one after the other in Deuteronomy 8:16-18. The manna was to test us so it would go well with us in the end—when we gained wealth. Wealth is to be treated the same as we treated manna—not to be hoarded, lest it rot. Moses gave the instructions for manna, Jesus gives the instructions for wealth, “Do not store up for yourselves treasures on earth, where moth and rust destroy, and where thieves break in and steal. But store up for yourselves treasures in heaven, where moth and rust do not destroy and where thieves do not break in and steal. For where your treasure is, there will your heart be also” (Matt. 6:19-21). Those who are rich toward God, who have placed their security and complete trust in Him alone, are those through whom He will do His work. A harvest of souls will be brought into the kingdom because they will be blessed beyond measure by The Almighty—El Shaddai. Zodiates, Key Word Study Bible, p. 1791.